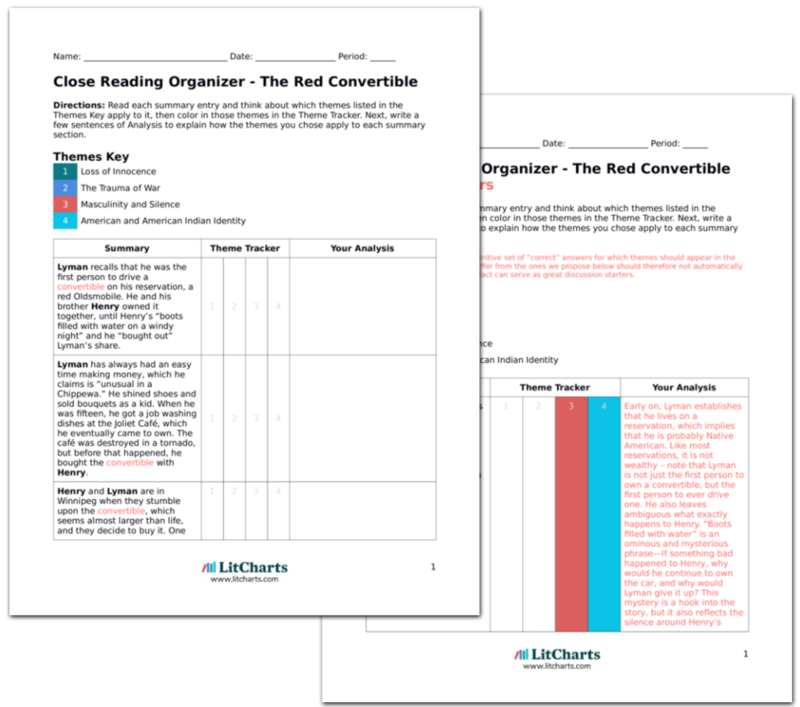 LitCharts assigns a color and icon to each theme in The Red Convertible, which you can use to track the themes throughout the work. In “The Red Convertible,” Henry and Lyman are both American and American Indian, and their identities and experiences are always shaped by a combination of those two factors. The general circumstances of the boys’ lives are shared by many Americans of all races: getting a car as a teenager, for instance, or being drafted into Vietnam. However, Erdrich also emphasizes that these typically-American experiences are always tempered by the boys’ American Indian identity. While their lives and their identities are by no means defined by their race, they are always affected by the undeniable realities of discrimination and the experience of living on a reservation. Henry and Lyman are fortunate in their youth because of how free and happy they are. They have a close relationship with one another, a loving mother, and their own car, which they paid for with their own money. They travel all over the continent with a lighthearted attitude, not considering any risks or responsibilities—all of which suggests that the boys have had a nice, easy childhood and are sailing seamlessly into young adulthood, too. Importantly, Henry and Lyman’s coming of age comes in tandem with a sports car, which is an American icon—boys in towns, suburbs, and cities all over the country were also coming of age in cars in the 1970s, and most were not fortunate enough to have a gorgeous convertible. This clearly situates Henry and Lyman as American boys—and reasonably lucky American boys at that—although their specific American Indian identity is never overlooked. Lyman says at the beginning of the story, for example, that he has always had “one talent,” making money, but he specifically claims that this is “unusual for a Chippewa.” Thus, his luck and his skill with money (which earn them the car in the first place) are explained in comparison to his impoverished Indian community, rather than to the country at large. In the scheme of all Americans, Lyman would simply be considered among the lucky boys to have a nice childhood and a great car, but he is the first and only person to drive a convertible on the reservation. Another way in which Erdrich puts American and American Indian identity in tension is through war. As an adult male American citizen, Henry is eligible for the draft—like thousands of other young men across the country, he goes to war involuntarily and comes back profoundly damaged. This was a widespread experience for American men in the 1970s, which situates Henry within a broader national context. However, like with the car, Erdrich is also clear about how his race complicates his situation. While many American veterans of all races received inadequate physical and mental healthcare, Henry’s care is nonexistent because of his identity. He and his family have a reasonable mistrust of most hospitals because of generations of mistreatment, there are no American Indian doctors on the reservation, and the only nearby doctor has a conflict of interest with their mother. Henry’s lack of treatment is certainly one of the factors that exacerbates his condition, and is surely part of the reason he dies. Erdrich does not adhere to stereotypes of impoverished or downtrodden American Indians. The boys come from a loving home, they have enough money, and they initially feel free and happy, despite coming from a community that has been systematically oppressed. It’s not their race that brings calamity to their lives, it’s the war—but the effects of the war would likely have been less severe if Henry had better access to healthcare (a lack of access related to his race). Furthermore, the psychological effects of stereotyping and discrimination are implicit in the story. Lyman notes Henry’s resemblance to Red Tomahawk (an American Indian found on highway billboards), for example, and he suggests that this resemblance might have earned Henry a more difficult military assignment. Henry also howls “Crazy Indians!” as a joke (referencing how non-Native people see them) before he jumps into the river. Their perception of themselves as Indians through white eyes is always present, though Erdrich is careful not to let it subsume the story. “The Red Convertible” thereby shows the complex intersection between national identity and the specific realities of American Indian life. The ThemeTracker below shows where, and to what degree, the theme of American and American Indian Identity appears in each chapter of The Red Convertible. Click or tap on any chapter to read its Summary & Analysis. Below you will find the important quotes in The Red Convertible related to the theme of American and American Indian Identity. I don't wonder that the army was so glad to get my brother that they turned him into a Marine. He was built like a brick outhouse anyway. We liked to tease him that they really wanted him for his Indian nose. He had a nose big and sharp as a hatchet, like the nose on Red Tomahawk, the Indian who killed Sitting Bull, whose profile is on signs all along the North Dakota highways. He says nothing. But I can tell his mood is turning again. "They're all crazy, the girls up here, every damn one of them." "You're crazy too," I say, to jolly him up. "Crazy Lamartine boys!" He looks as though he will take this wrong at first. His face twists, then clears, and he jumps up on his feet. "That's right!" he says. "Crazier 'n hell. Crazy Indians!" Feinman-Riordan, Grace. "The Red Convertible Themes: American and American Indian Identity." LitCharts. LitCharts LLC, 31 Aug 2018. Web. 11 Dec 2018. Feinman-Riordan, Grace. 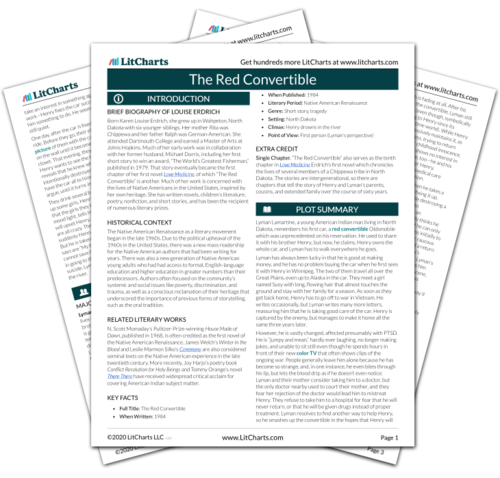 "The Red Convertible Themes: American and American Indian Identity." LitCharts LLC, August 31, 2018. 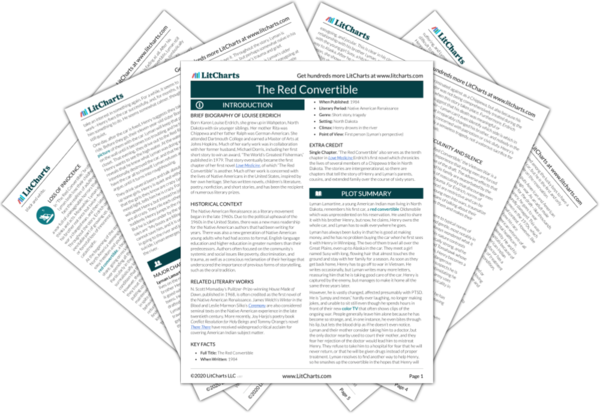 Retrieved December 11, 2018. https://www.litcharts.com/lit/the-red-convertible/themes/american-and-american-indian-identity.